On the eve of Antyodaya Diwas 2017, the government has celebrated the “Bharat Ke Kaushalzaade” occasion on 24th September this year. Antyodaya Diwas has completed 3 years this year. on this occasion the government has celebrated the youth skill development programs that has encouraged the youth talent in rural areas. On this occasion the Ministry of Rural Development has felicitated the beneficiaries who were registered under the two skill development programs in India namely Rural Self Employment Training Institute and Deen Dayal Upadhyay Grameen Kaushalya Yojana. Nearly 800 beneficiaries have been felicitated on this occasion. The government of India has declared Antyodaya Diwas on 25th September to celebrate the birthday of late Shree Deen Dayal Upadhyay. He was a veteran politician. On this day the respective state governments will arrange various activities and event throughout the country by establishing camps and such. Blood donation camps, seminars, symposia and much more activities will be held on this occasion. The day was officially celebrated since year 2015. This is the 3rd year of Antyodaya Diwas. As the day is celebrated on the occasion of Pandit Deen Dayal’s birthday, events associated with youth talent and skills are being arranged in various places. 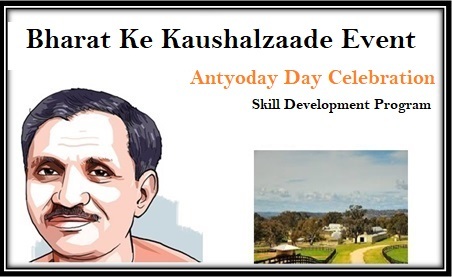 This year just before the Antyodaya Diwas has come, the government of India has celebrated the skill and capabilities of the youth of the nation, especially from rural areas in Bharat Ke Kaushalzaade. The occasion was, as said, to felicitate the beneficiaries from across the rural areas. All of them have enhanced their skill and knowledge through these two above mentioned schemes. DDU GKY and RSETI have focused on developing skill and knowledge in rural youth. The main agenda of these schemes is to make the youth self-sufficient so that they can set up their own business or work to survive. DDUGKY has been into industry level training whereas RSETI has been catering training processes that can make one self sufficient and competitive for start-ups. These two institutions/schemes have launched to provide advanced skills and knowledge that will make the youth globally competitive. Under DDUGKY the trainees have managed to grab jobs in many places like KFC, Pizza Hut, Matrix, Safe Express and many more. The scheme not only provides industry level training but also helps the youth to get into jobs for more practical knowledge. On this occasion many of the ministers and leading people were present. Minister of Rural Development has stated that the initiative taken by Modi government is very progressive and helpful for the youth unemployed population in India. Also he had stated that more people should enrol under Kaushal Panjee which is a new skill based employment program launched on the occasion. The registration will be available from 1st of October to 15th of October 2017. Kaushal panjee is a new program by the government that has been launched on Bharat ke kaushalzaade event. According to this new program, the youth who are being trained under DDU-GKY and RSETI will be mobilized to various other sectors for jobs. This will open up more opportunities for them to get into jobs. The mobilization of human resources under this program will be done through Self help groups, gram panchayats, directly by the candidates, block officers, and CSCs and so on. This will not only create opportunities for the youth population but also make them ready for the global markets. Kaushal Panjee will be connected with Social Economic Caste Census. This means under this scheme the states can mobilize the skilful youths according to their social economic position and their standard of living and such. The occasion has targeted those who have achieved a lot through these programs under rural employment schemes. They are being named as the stars by the authority. Also in this event RSETI has gotten a new logo that was launched by the government. The logo depicts the future stars that is the youth achievers under the institute and DDUGKY scheme.